The Auckland volcanic field is an area of monogenetic volcanoes covered by much of the metropolitan area of Auckland, New Zealand's largest city, located in the North Island. The approximately 53 volcanoes in the field have produced a diverse array of maars (explosion craters), tuff rings, scoria cones, and lava flows. Aside from Rangitoto, which erupted repeatedly, no volcano has erupted twice, but eruptions lasted for various periods ranging from a few weeks to several years. The field is fuelled entirely by basaltic magma, unlike the explosive subduction-driven volcanism in the central North Island, such as at Mount Ruapehu and Lake Taupo. The field is currently dormant, but could become active again. The field ranges from Lake Pupuke and Rangitoto Island in the north to Matukutururu (Wiri Mountain) in the south, and from Mount Albert in the west to Pigeon Mountain in the east. The first vent erupted at Onepoto 248,000 ± 28,000 years ago. The most recent eruption (about 600 years ago and within historical memory of the local Māori iwi) was of Rangitoto, an island shield volcano just east of the city, erupting 2.3 cubic kilometres of lava. The eruptions have tended to become bigger over time, with Rangitoto making up almost 60 per cent of the field's entire volume of erupted material. The field's volcanoes are relatively small, with most less than 150 metres (490 ft) in height. Lake Pupuke, on the North Shore near Takapuna, is a volcanic explosion crater. A few similar craters such as Orakei Basin are open to the sea. The field has produced voluminous lava flows that cover much of the Auckland isthmus. One of the longest runs from Mt Saint John northward, almost crossing the Waitematā Harbour to form Meola Reef. More than 50 lava tubes and other lava caves have been discovered, including the 290-metre (950 ft)-long Wiri Lava Cave. 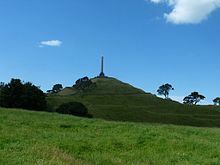 The second-longest individual cave in the Auckland field, some 270 metres (890 ft) in total length, is the Cave of a Thousand Press-ups to the east of Maungakiekie/One Tree Hill. Two impressive depressions caused by lava cave collapses are the Puka Street Grotto and the nearby Hochstetter Pond, also known as Grotto Street Pond, in Onehunga. For most of the 250,000 years that the field has been erupting, the planet has been in glacial periods (ice ages) where sea levels were much lower due to water being locked up as ice, and the Waitemata and Manukau Harbours were dry land. All the volcanoes probably erupted on land except for Rangitoto, which erupted during the current interglacial (warmer) period. Many of the volcanic cones were occupied by substantial Māori pā before European settlement, and many terraces and other archeological remnants are still visible. Many of the cones have been levelled or strongly altered—in small part due to the historical Māori use, but mostly through relatively recent quarrying of construction materials (especially scoria). However several of the remaining volcanoes are now preserved as landmarks and parks. The cones are also protected by a 1915 law, the Reserves and Other Lands Disposal and Public Bodies Empowering Act 1915, which was passed due to early concern that the distinctive landscape was being eroded, especially by quarrying. While often ignored until the late 20th century, it has amongst other things minimised severe changes to Mount Roskill proposed by Transit New Zealand for the Southwestern Motorway. In March 2007, New Zealand submitted the volcanic field, with several specifically named features, as a World Heritage Site candidate based on its unique combination of natural and cultural features. At that time, only 2 per cent of more than 800 World Heritage Sites worldwide were in this "mixed" category. Since the field is not extinct, new volcanic events may occur at any time, though the usual period between events is, on average, somewhere between hundreds to thousands of years. However, the effects of such an event—especially a full-scale eruption—would be substantial, ranging from pyroclastic surges to earthquakes, lava bombs, ash falls, and the venting volcanic gas, as well as lava flows. These effects might continue for several months, potentially causing substantial destruction and disruption, ranging from the burial of substantial tracts of residential or commercial property, to the mid-to-long-term closures of major parts of the country's infrastructure such as the Port of Auckland, the State Highway network, or the Auckland Airport. It is possible that several volcanoes could erupt simultaneously. There is strong evidence that five erupted within a span of 50 years or less, approximately 32,000 years ago. Various operative structures, plans and systems have been set up to prepare responses to volcanic activity within the urban areas, mainly coordinated in the 'Auckland Volcanic Field Contingency Plan' of the Auckland Regional Council, which provides a framework for interaction of civil defence and emergency services during an eruption. Auckland also has a seismic monitoring network comprising six seismometers—including one 250 metres (820 ft) deep at Riverhead—and three repeaters within the region that will detect the small tremors likely to precede any volcanic activity. This is likely to give between a few hours and several days' warning of an impending eruption, and its approximate location. Auckland War Memorial Museum, itself built on the crater rim of Pukekawa, has an exhibition on the field, including the "Puia Street multi-sensory visitor experience", which simulates a grandstand view of an eruption in Auckland. In 2013, scientists said new studies showed Rangitoto had been much more active in the past than previously thought, suggesting it had been active on and off for around 1000 years before the final eruptions around 550 years ago. Civil Defence officials said the discovery did not make living in Auckland any more dangerous, but did change their view of how an evacuation might proceed. ^ a b Hayward, Bruce W.; Murdoch, Graeme; Maitland, Gordon (2011). Volcanoes of Auckland: The Essential Guide. Auckland University Press. ISBN 978-1-86940-479-6. ^ Ian E.M. Smith and Sharon R. Allen. Auckland volcanic field geology. Volcanic Hazards Working Group, Civil Defence Scientific Advisory Committee. Retrieved 30 March 2013. Also published in print as Volcanic hazards at the Auckland volcanic field. 1993. ^ a b Beca Carter Hollings & Ferner (2002). Contingency Plan for the Auckland Volcanic Field, Auckland Regional Council Technical Publication 165. Accessed 12 May 2008. ^ Hayward, Murdoch, Maitland (2011). pp. 134–135. ^ David Lomas (Winter 2006). "Cave new world". Heritage New Zealand. Accessed 4 May 2007. ^ Kermode, Les (March 1994). "New Zealand lava caves worth preserving for their geologic and geomorphic features" (PDF). Geoscience Reports of Shizuoka University. 20: 15–24. Archived from the original (PDF) on 3 August 2016. Retrieved 6 December 2011. ^ Hayward, Murdoch, Maitland (2011). pp. 17–18. ^ "Geology". The Onehunga Grotto. Retrieved 25 April 2013. ^ Hayward, Murdoch, Maitland (2011). pp. 2–3. ^ a b "When the earth starts to shake". City of Fire, insert magazine in The New Zealand Herald, 15 February 2008. ^ New recorder boosts earthquake, volcano warnings, The New Zealand Herald, NZPA, 11 May 2008. Accessed 2008-05-12. ^ "Volcanoes". Auckland War Memorial Museum. Retrieved 28 September 2017. ^ "Rangitoto more active than thought – study". 3 News NZ. 11 April 2013. ^ "Officials downplay volcano danger". 3 News NZ. 12 April 2013. ^ Lindsay, J.M. ; Leonard, G.S. ; Smid, E.R. ; Hayward, B.W. (December 2011). "Age of the Auckland Volcanic Field: a review of existing data". New Zealand Journal of Geology and Geophysics. 54 (4): 379–401. doi:10.1080/00288306.2011.595805. Lava and Strata: A guide to the volcanoes and rock formations of Auckland. Homer, Lloyd; Moore, Phil & Kermode, Les; Landscape Publications and the Institute of Geological and Nuclear Sciences, 2000. ISBN 0-908800-02-9. "Probabilistic assessment of future vent locations and eruption styles for the Auckland Volcanic Field, New Zealand". Magill, Christina R; McAneney, K.J. ; Proceedings of the International Association for Mathematical Geology 2003, Portsmouth, UK, 7–12 September 2003. Volcanic risk ranking for Auckland, New Zealand. I: Methodology and hazard investigation. Magill, Christina R.; Blong, Russell; Bulletin of Volcanology, Volume 67, Issue 4, April 2005, Pages 331 – 339, DOI 10.1007/s00445-004-0374-6, accessed 2006-07-14. City of Volcanoes: A geology of Auckland. Searle, Ernest J.; revised by Mayhill, R.D. ; Longman Paul, 1981. First published 1964. ISBN 0-582-71784-1. "Facies analysis of pyroclastic deposits within basaltic tuff-rings of the Auckland volcanic field, New Zealand (abstract)". Sharon R. Allen, Vivienne F. Bryner, Ian E. M. Smith, Peter F. Ballance, New Zealand Journal of Geology and Geophysics, 1996, Vol. 39: 309–327. 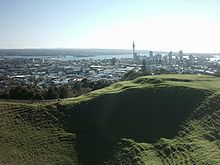 Wikimedia Commons has media related to Auckland volcanic field. "Auckland field". Global Volcanism Program. Smithsonian Institution. "Volcanoes". Auckland War Memorial Museum. Retrieved 28 September 2017. Geology: Rocks and minerals, School of Geography, Geology and Environmental Science, University of Auckland (with interactive maps, requiring Apple QuickTime). This page was last edited on 10 February 2019, at 02:57 (UTC).